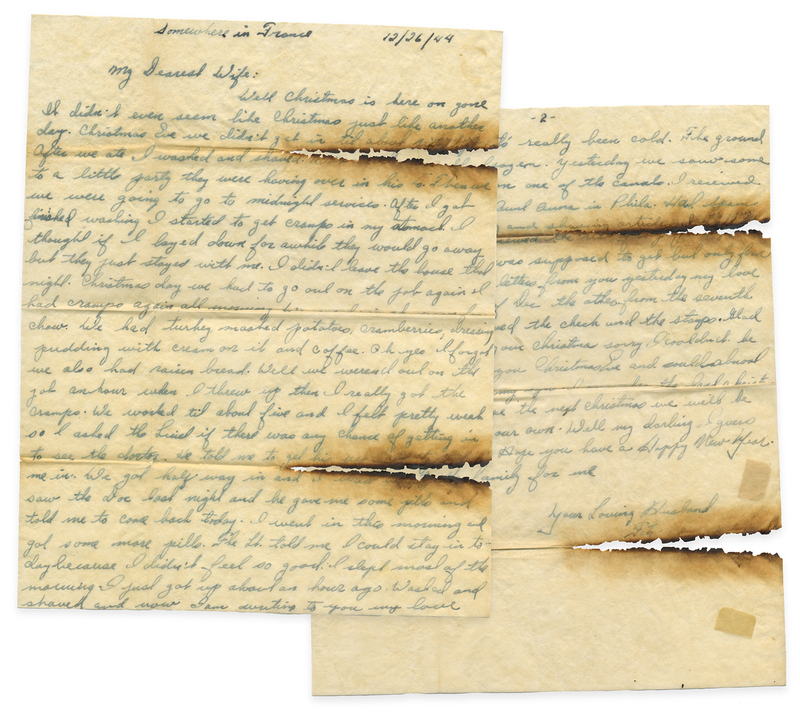 Carolyn Porter | December 26, 1944: "Somewhere in France"
See/read letter written December 26, 1944 by a US soldier stationed in France. Well Christmas is here an gone. It didn’t even seem like Christmas just like another day. Christmas Eve we didn’t get in till about six. After we ate I washed and shaved. Was [illegible due to paper damage] to a little party they were having over in his Co. Then we were going to go to midnight services. After I got finished washing. I started to get cramps in my stomach. I thought if I played down for awhile they would go away but they just stayed with me. I didn’t leave the house that night. Christmas day we had to go out on the job again I had cramps again all morning. We went in at noon for chow. We had turkey, mashed potatoes, cranberries, dressing, pudding with cream on it and coffee. Oh yes I forgot we also had raisin bread. Well we weren’t out on the job another hour when I threw up then I really go the cramps. We worked till about five and I felt pretty weak so I asked the Lieut if there was any chance of getting in to see the doctor. He told me to get his jeep [illegible due to paper damage] me in. We got half way in and I threw up [illegible] saw the Doc last night and he gave me some pills and told me to come back today. I went in this morning and got some more pills. The Lt. told me I could stay in today because I didn’t feel so good. I slept most of the morning. I just got up about an hour ago. Washed and shaved and now am writing to you my love. The last few days it’s really been cold. The ground and canals are all frozen. Yesterday we saw some children ice skating on one of the canals. I received a package from my Aunt Anna in Phila. Had spam, chicken, candy, chewing and shaving articles [illegible due to paper damage] know why I didn’t received the [illegible] counted about then. I was supposed to get but only four got here. I received two letters from you yesterday my love. One was from the six of Dec. the other from the seventh. Glad to hear you received the check and the stamps. Glad to hear you enjoyed your Christmas sorry I couldn’t be with you. I thought of you Christmas Eve and could almost see you when I closed my eyes. I remember the last Christmas I spent with you. I hope the next Christmas we will be together in a home of our own. Well my darling I guess this is all for now. Hope you have a Happy New Year. Say hello to the family for me.